The Social Fixer extension cannot uninstall itself. Uninstalling an extension is a function of your browser, you have to tell your browser to remove it. 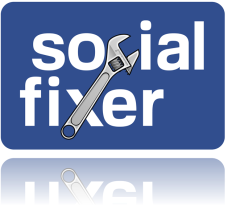 Since many of you asked: "How to uninstall Social Fixer for Facebook?" Luckily, this is simple, just find your browser in the list below and follow the instructions. 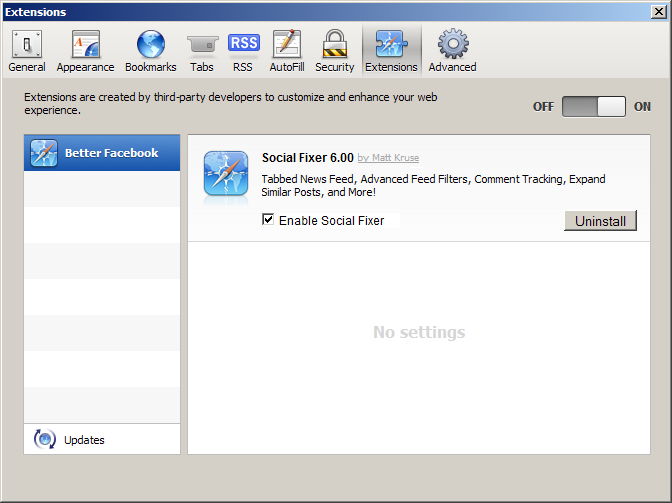 Here's how to install Social Fixer for Facebook. - Type chrome://extensions/ in your browser, then click the uninstall link by Social Fixer. - Right-click the monkey icon in the bottom toolbar, then Manage User Scripts. Click on Social Fixer in the list, then Uninstall. - Go to Tools->Add-Ons. Find Social Fixer and click Uninstall. - Go to Preferences and then Extensions. Note: If something doesn't work, try consulting the Help for your browser or checking Google. A problem that was driving me crazy has now been fixed. Thank you! Thank you for posting this. Very concise and helpful. Exactly what I was looking for. Thanks for visiting and congratulations on your blog! Be always welcome to my place! A happy Thursday to you. This information is incorrect. Going to "Tools + Add ons" does give you a list of the add ons you have, it just offers you more add ons. NO help whatsoever. Thanks for wasting my time.